On a recent trip to Italy this storefront design grabbed me immediately. The rich character, warmth and quirkiness – pulled at me to go inside. 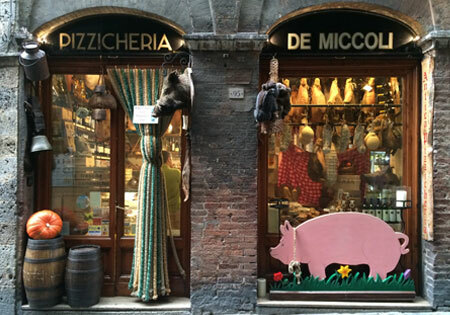 The shop owner of this meat, cheese and wine store in Siena, Italy was proud of his offerings; and rightfully so. His attention to detail was everywhere on the inside. Pizzicheria De Miccolino has no menu, the concept here is to use your senses. Look, smell, taste, chat and enjoy the atmosphere. Of course we purchased several picnics worth of savory goodies and left with a very unique experience too. This entry was posted on February 24, 2015 at 9:35 am and is filed under Branding, graphic design, Packaging, Personal Faves. You can follow any responses to this entry through the RSS 2.0 feed. You can leave a response, or trackback from your own site.